Ellie's Dairy - The Finest Goat Milk, from Kent: Footsie has a day out! Well, it's been an exciting and busy week here at Ellie's Dairy. On Tuesday, we welcomed a small group of Hadlow Agriculture students for a visit. They spent some time with the goats and asked plenty of questions and I think that their tutor Julie was seriously considering taking a couple of the babies home with her on the minibus! 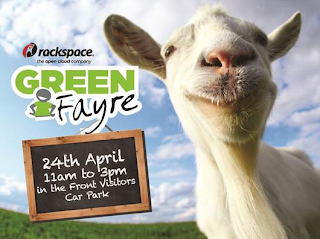 The following day was gloriously warm and sunny as I loaded up Footsie and a small selection of cute babies to travel to Hayes (near Heathrow) for the first Rackspace Green Fayre. Rackspace is a world leader in web hosting and is located in a fabulous office building on a small park very close to Heathrow Airport. We had been invited to take part in their first 'Green Fayre', along with a number of other London Farmers Market traders, and I had suggested to the organisers that we could take a few goaties along for everyone to see. This idea was welcomed very enthusiastically and everyone at Rackspace (commonly known as 'The Rackers') were all very excited about meeting some of our girls. Apparently, they had become something of a star attraction! We loaded everyone into the trailer and set off nice and early to try and avoid all those irritating roadworks on the M25. Which we did ... very nicely. Sailed through them, in fact. Only to get stuck a couple of junctions later for some kind of breakdown ... So, by the time we got to Rackspace, poor Footsie was hot and bothered and very grumpy. As we arrived in the car park, a big cheer went up and lots of people ran over to help us unload. Barely had I backed the trailer into position when 4 huge buckets of fresh water appeared for Footsie and the babies! The organisers Laura, Annelie and Matt were so friendly and helpful and so many other people came over and offered to help. Having got all the goaties settled, I quickly set up our cheese stall and then we all just waited for the Rackers to come out and see us! It must have been an odd sight looking out of the office window to see a livestock trailer and a bunch of goats on the beautifully manicured front office lawn. I had put a few bottles of warm milk in a bucket by the trailer and it didn't take long for all those hardened teccies to start feeding babies. At one stage, there were no babies in the trailer at all - they were all being cuddled by Rackers! The goaties seemed very popular indeed and everyone was thrilled to be able to touch and feed them. There were many photos taken and apparently we were all up on Facebook within minutes! Footsie gradually recovered from her journey and was soon standing up on the fence asking everyone for bananas. The weather stayed fine and warm all day but soon it was time to pack everything up and get back on that M25. The journey home was slow but not too traumatic and Footsie was very glad to get home! She and the babies were all exhausted after their exciting day and were all soon fast asleep in their barn. I hope that the Rackers enjoyed their goatie day as much as we all did. Hopefully, the Green Fayre will become an annual event and maybe we will be invited back again next year if we didn't make too much mess on the front lawn!! There'll be no stopping those goaties now ... the babies will be demanding laptops and iPads next..
OH RABBITS... SHE had a day off last wednesday and would have LURVED to meet Footsie and the small Goaty folk! However, SHE hopes that it will be fine on Saturday as SHE has promised to cut some Rosemary for Constance and give it to Debbie @ the Parson's Green Market on Sunday. Fingers crossed.. is there any sign of those grass seeds growing yet? See YOU on Sunday.